Organizational project management is a method to link all projects to corporate strategy. For a company manages remote projects communication becomes the key success factor affects corporate goals. It is extremely important to bring all projects together and see each project status and its impact on corporate strategy. This allows you to make prompt decisions and keep your company focused on strategic goals. Remote Presentation for Skype solution for ConceptDraw MINDMAP helps communicate project statuses and corporate goals. Using this solution for regular status meetings allows you to keep all remote projects focused on corporate goals. 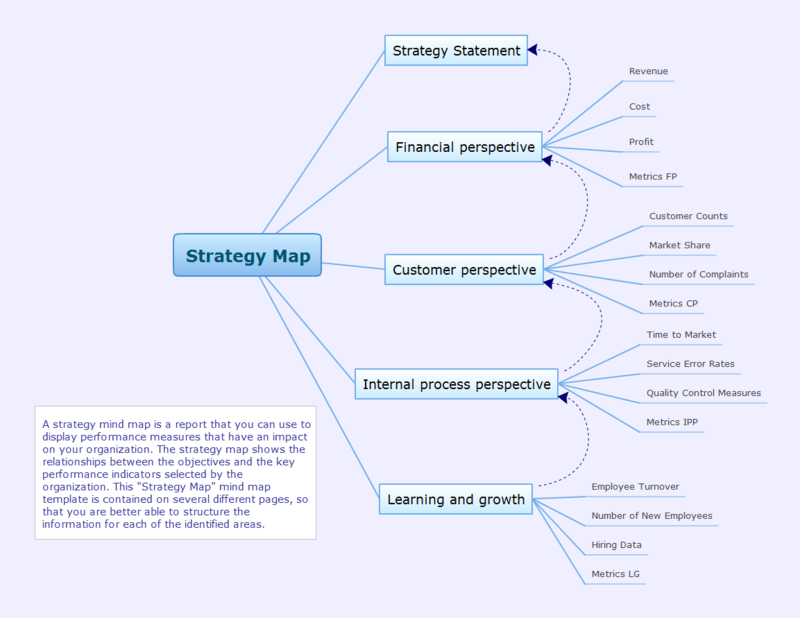 Strategy mind map template is created using ConceptDraw MINDMAP mind mapping software. This mind map example helps to learn how to use mind map presentation via Skype for remote projects in corporate strategy. To build Strategies - powerful feature of ConceptDraw MINDMAP v10 allows to combine the power of MINDMAP with the accessibility of the world’s favorite human memory platform, Evernote. Historical reference about the Gantt chart.